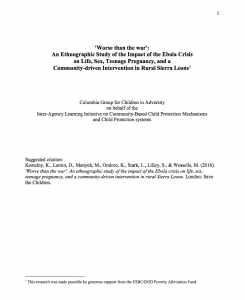 The purpose of this research, undertaken by the Inter-Agency Learning Initiative on Community-Based Child Protection Mechanisms and Child Protection Systems, is to illuminate both the wider impacts of the Ebola crisis on people's lived experiences, with an emphasis on children, and its more specific effects on issues related to teenage pregnancy and its prevention. The key findings are presented in three sections: general effects of the Ebola crisis, effects on teenage pregnancy and related issues, and effects on the community-driven intervention. Four key recommendations grew out of this research, which include strengthening the training and monitoring of emergency workers, improving the alignment between community practices and those recommended by Westernized health systems, building emergency preparedness and response and disaster risk reduction into community-driven interventions, and re-prioritizing the prevention of teenage pregnancy in Sierra Leone, building social protection into prevention efforts.